Still looking for March events? Click here! Learn more about Keep Georgia Beautiful Month by clicking here. Learn more about Get Outside Month by clicking here. Experience! Kayaking the salt marsh is an unforgettable experience. Come explore at Crooked River State Park, Apr 2. Date Night! Hike Cloudland Canyon State Park by the silvery light of the Full Moon on Apr 3, 7-9PM. Experience! Saddle up for a one-hour Summer Woodlands Horseback Ride with the naturalist at FDR State Park. Apr 3. Registration required. Date Night! Paddle a canoe under the stars at George L Smith State Park on Apr 3, 7:30-9PM. Registration required. Date Night! Take your date on a full moon kayak tour at Hard Labor Creek State Park Apr 3 & 4, 7:30-9PM. Date Night! Take a hike by the light of the full moon at Tallulah Gorge State Park, 7:30PM on Apr 3. Register in advance. Experience! Grab a tube or hop in a raft and float down the Chattahoochee River! Shoot The Hooch opens for weekends on Apr 3! Date Night! Enjoy a sunset view from Panola Mountain on this guided hike that ends with a moonlit stroll & lakeside s’mores. Register in advance. Apr 4, 6-8PM. Kids! Experience Stone Mountain Park’s Spring FUN Break with the regular attractions, live entertainment and more from Apr 4-11. Date Night! Experience Okefenokee Swamp as the sun sets on Stephen C Foster State Park, Apr 9 at 7PM. Space is limited, register in advance. Volunteer! Keep Georgia Beautiful by volunteering to Sweep The Hooch! This is the biggest cleanup event for our precious Chattahoochee River. 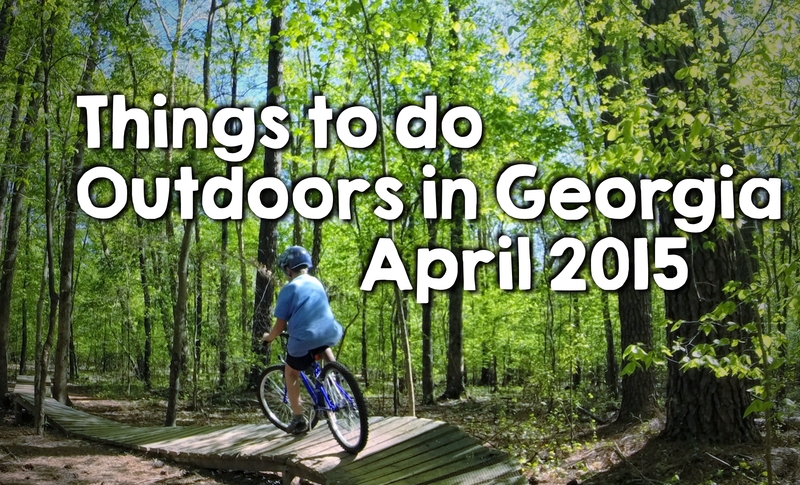 Join in the fun at multiple locations: Chattahoochee River NRA, Don Carter State Park, Chattahoochee Bend State Park. Volunteer! at Vogel State Park’s Annual Volunteer Day. Install bricks in the memory walkway, help to upgrade campsites, and maintain trails. All day Apr 11. Experience! Take a guided hike to enjoy spring at Georgia’s newest State Historic Site, Hardman Farm. Apr 11 at 10am. Date Night! Ranger-led paddle to view wildlife and enjoy the sunset at Fort Yargo State Park. Apr 11, 7PM Register in advance. Date Night! Head to Reed Bingham State Park to enjoy a pontoon boat expedition spotting gators and gazing at the stars on Apr 11 at 7PM. Registration is required. Experience! Hike to Bridal Veil Falls, in Tallulah Gorge State Park, to watch kayakers brave the whitewater on Apr 12 11AM-2PM. Register in advance. Date Night! Brilliant stargazing by Kayaking under a new moon at Hard Labor Creek State Park, Apr 17 & 18 at 8PM. Pre-register! Date Night! Explore the Ghosts & Legends of Hofwyl-Broadfield Plantation on a moonlit stroll through the Live Oaks. Apr 17 & 18 at 7PM. Kids! Join the ranger for a guided Earth Day Hike at Laura Walker State Park on Apr 18 at 9AM. Education! Learn about one of Georgia’s largest and most elusive snakes at Don Carter State Park. Project Pine Snake starts at 2PM on Apr 18. Date Night! Etowah Indian Mounds Historic Site will be illuminated by torchlight for amazing nighttime views. Apr 18 until 9PM. Experience! Explore the tree canopy by climbing trees with the experts at Panola Mountain State Park’s Introduction to Tree Climbing. Apr 18 at 1PM. Registration required. Explore! Providence Canyon State Park’s interpretive ranger leads hikers on an interesting geology hike. Apr 18 at 11AM. Education! Explore the night sky with astronomers at Providence Canyon State Park. Starts at 7PM on Apr 18. Explore! Kayak coastal Crooked River State Park at high tide to celebrate Earth Day. Limited space for this fun river paddle, register early. Apr 22 11L50AM. Education! Join Atlanta Audubon Society for a beginners bird walk at Hard Labor Creek State Park to learn more about Georgia’s birds. Apr 10 at 10AM. Date Night! Enjoy a peaceful twilight lake paddle at Sweetwater Creek State Park. Apr 24, 7PM. Reservations required. Kids! Learn all about local snakes, turtles and lizards at FDR State Park’s Reptile Review on Apr 25 at 11AM. Explore! Discover the history of Okefenokee touring Billy’s Island at Stephen C Foster State Park. Apr 25, 10AM. Date Night! Practice the basics of paddling on this guided sunset tour at Stephen C Foster State Park. Apr 25 at 6PM. Explore! Kayak a peaceful stretch of Sweetwater Creek and an optional hike to view the mill ruins on Apr 18, 11AM. Experience! You’ll get muddy and wet as you climb and crawl through a wild cave at Cloudland Canyon State Park. Guides lead the way. Reservations required. Apr 29, 10AM.